Diane Guerrero is an actress on the hit shows Orange is the New Black and Jane the Virgin. She was just fourteen years old on the day her parents were detained and deported while she was at school. Born in the U.S., Guerrero was able to remain in the country and continue her education, depending on the kindness of family friends who took her in and helped her build a life and a successful acting career for herself, without the support system of her family. She has written about her family in the Los Angeles Times and her book In the Country We Love, and she has appeared on CNN to discuss immigration issues. She also volunteers with the nonprofit Immigrant Legal Resource Center. She lives in New York City. In the Country We Love was published in May 2016 with rave reviews from Kirkus Reviews and Publisher’s Weekly: “Guerrero transforms a truly terrible situation into something meaningful, using her story and her role as an Ambassador for Citizenship and Naturalization by the White House to try to help other immigrant families left in this terrible position.” Diane Guerrero continues the conversation through activism, speaking engagements, and the forthcoming television show of the same name. 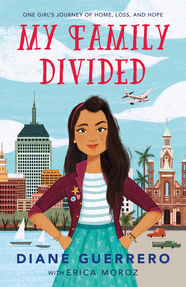 The young readers adaptation of her memoir, My Family Divided, was released in July 2018. One day while Diane Guerrero was in school, he parents were deported, tearing her family apart and leaving the fourteen year old to fend for herself. In the Country We Love is a moving, heartbreaking story of one woman's extraordinary resilience in the face of the nightmarish struggles of undocumented residents in this country. Before landing a spot on the megahit Netflix show Orange is the New Black; before wow-ing audiences as Lina on Jane the Virgin; and before her incredible activism and work on immigration reform, Diane Guerrero was a young girl living in Boston. One day, while Guerrero was at school, her undocumented immigrant parents were taken from their home, detained, and deported. Guerrero's life, which had been full of the support of a loving family, was turned upside down. In the Country We Love Drawing from personal experience and her book of the same title, Diane discusses immigrants' rights, family, and American life. Praise for In the Country We Love: "Guerrero, 14 at the time, was left on her own with no government oversight whatsoever, a harrowing situation that she recounts with honesty, pathos, and bravery...Guerrero transforms a truly terrible situation into something meaningful, using her story and her role as an Ambassador for Citizenship and Naturalization by the White House to try to help other immigrant families left in this terrible position." “Orange Is the New Black actress Guerrero delivers an affecting tale of a childhood lived in the margins. . . . lovingly detailed in colloquial and well-paced prose . . . The author's candor in chronicling the lowest moments of her life reads like an urgent confessional. . . The author's greatest strength lies in her ability to advocate for undocumented immigrants and others affected by immigration status: 'I've written the book that I wish I could have read when I was that girl.' A moving, humanizing portrait of the collateral damage caused by America's immigration policy." "Guerrero relates her struggle to hold her life together, get through high school and college, and find her feet in the world--challenges that will resonate with many readers...[She] writes with humor and heartbreaking honesty. Offering readers the story she needed to hear as a child, Guerrero shines a light on this country's flawed immigration system, eloquently calling for reform without diminishing her appreciation for the opportunities US citizenship has afforded her. A timely and enlightening read." "In the Country We Love is the poignant, candid, and often shocking account of the challenges Guerrero faced as a citizen child of undocumented parents." "In the Country We Love is a necessary story for our times...It is a heartrending memoir that humanizes the story of America’s immigration policies and helps us all find a way to understand the challenging questions and ineffective strategies of current policies and practices."